This is one for the serious wine connoisseur, that have invested in the perfect bottle for some future occasion, the single bottle wine cellar. Considering the single bottle cellar will set you back a whopping $405.49 this is only for the real wine buff. 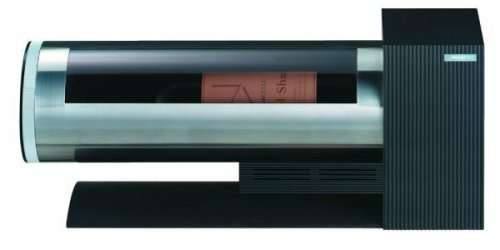 The Angelshare single-bottle cellar that special bottle of wine in its own temperature and humidity controlled time capsule for that special occasion in the future, whether it’s a birthday, anniversary, graduation or other significant event in your life or of those closest to you. The compact dimensions and elegant, understated design makes the single-bottle cellar a focal point in any setting and an ideal presentation package to treasure. As most of my bottles (or should that be boxes) of wine cost around $8 I’ll be giving this one a miss. But if you can afford to waste invest some cash in a serious bottle you can get the single bottle cellar from Compact, found via acquire. But but…..I won’t be able to fit my box of wine in there!